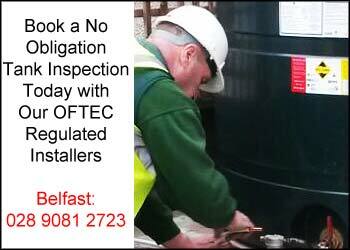 Our OFTEC registered staff can advise you on the ideal bunded or single skin oil tank for your home and commercial premises. Have you got a leaking oil tank? Call us now to discuss our tank replacement services on Belfast 028 9081 2723. We can disconnect your existing tank, remove it for recycling and install a new tank for you. If required, we can replace the base but we only carry out the work that’s needed, saving you time and money. Read more about our oil tank replacement services here. Double skinned oil tanks (bunded) may be required by law, depending on your circumstances. Click here for details of bunded tanks or call us today to discuss your requirements. Know the Tank You’re Looking For? 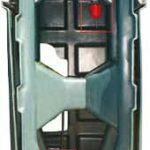 If you know the type of tank you need, choose from our range of Ecosafe Bunded Oil Tanks, Single Skin Titan Oil Tanks or Fuelmaster and DieselPRO Oil Tanks. 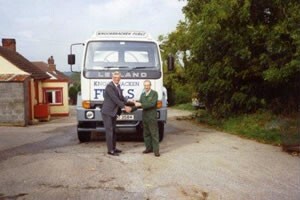 Tom Carson, founder of the business receiving his first brand new oil tanker in 1989. Knockbracken Fuels is a family business, founded in 1986 by Tom and Rita Carson who felt at the time, led by God into oil distribution and oil tank services. The company continues to provide home heating oil and oil tank replacement and installation services throughout Northern Ireland. 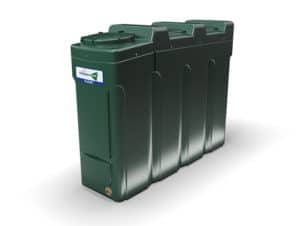 Based in Belfast, we have a full range of CE approved oil tank sizes for sale in various shapes and sizes. We also offer a selection of oil tank brands and related services. For commercial fuel deliveries, visit www.knockbrackenfuels.com/commercial/ and for agricultural deliveries go to www.knockbrackenfuels.com/agriculture/. We are very pleased with the efficiency with which the work was undertaken and the pleasant, friendly workers that undertook the work they are a real advertisement for Knockbracken Fuels. “Enclosed please find a cheque for the excellent work which was carried out by your workmen regarding the replacement of my faulty Oil Tank. I was delighted with the speed that you responded to my leak at the tank. Both your workmen who carried out the replacement also the construction of a concrete base were very professional and it was obvious to me that they were aware of what was required to deal with the problem, they also had a very pleasant nature. I obtained your name and address from the yellow pages and I will most surely recommend you to any of my friends who find it necessary to replace their oil tank.